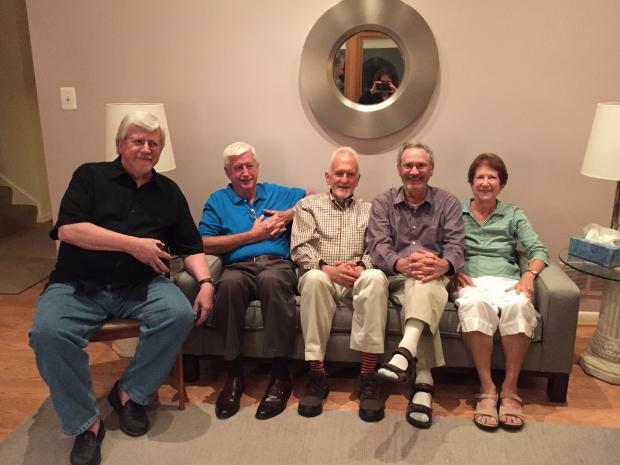 When Ray Barnett and wife Tammy were staying with Jon Bascom and Leslie at their home just outside Washington, D.C. this summer of 2015, Jon took the occasion to call a mini-reunion of Edison63 on July 2, offering Bascom burgers and beer and side dishes at his place. Bill Geffen and Barbara made it, as did Ruth Dritch Salinger and Peter. By happy coincidence, Gordon Hunt was in WDC on business, so he joined us as well, thus atoning for missing the 50th reunion in Tulsa. All had a fabulous time. Since the Barnetts' beloved San Francisco Giants were playing the Bascom's beloved Washington Nationals the next day, we all got tickets on the first base line and sat in the steady drizzle watching the mighty Nats trounce the Giants.